New to the GAR100 last year, this Egyptian full-service firm was set up by Karim Youssef in 2016 after more than five years as partner at Amereller Legal Consultants in Cairo and Dubai, where he headed the Middle East arbitration practice. Before that, he practised for two years at Cleary Gottlieb Steen & Hamilton. He has worked on some high-profile commercial and investment treaty arbitrations, often relating to public contracts awarded by states in the region. It’s now a 20-strong practice, including a counsel and a group of senior associates. It takes pride in having an unusually large proportion of female lawyers compared with its competitors in the region. The firm has advised the Arab African International Bank, Cementos La Union group, Arabian Cement Company and its parent Cementos La Union Group, Veolia Proprete, IGI Group, CTIP Oil & Gas, Damietta International Ports Company, KGL, Egyptian Kuwait Holding Company, Arab Contractors Company and EgyptAir. Karim Youssef’s greatest hits include helping Egyptian television station CBC prevail in a claim against Egyptian satirist Bassem Youssef, who has been described as Egypt’s answer to US comedian Jon Stewart. He has also successfully defended the Egyptian branch of a major energy conglomerate in a dispute over the supply of power generators. In a case brought over from Amereller, Youssef helped settle a six-year long UNCITRAL case concerning a mid-1990s privatisation that was unwound by a judicial decision in the wake of the Arab Spring. Since opening in 2016, the firm’s arbitration practice has more than tripled in size, both in terms of head-count and amounts in dispute; its current case load involves claims in excess of US$4.5 billion. The firm is co-counsel for investors in a US$2.3 billion commercial claim against an Egyptian state entity arising from the unwinding of a 40-year concession in relation to the build, operate and transfer of one of Egypt’s major seaports. It is also counsel to an Italian oil and gas company in a high-value CRCICA claim against the UAE’s Dana Gas and its Egyptian subsidiary in a dispute arising from two oil and gas concessions in Egypt. Last year, the firm obtained a favourable settlement for developer Al Kholoud in a major UNCITRAL proceeding against Egypt and two state entities arising from the judicial unwinding of a Mubarak-era privatisation of a steam boiler manufacturer in the wake of the 2011 revolution. In the investment treaty arena, it is acting for Spanish investors Cementos La Union and Aridos Jativa in a €400 million ICSID claim against Egypt relating to their investment in one of Egypt’s biggest cement companies. The firm also has another treaty claim on the books against a French-speaking African state which is being heard under institutional rules. Youssef was appointed as arbitrator in a treaty claim under the SCC rules involving an African state. He is also acting as arbitrator in a commercial case relating to a dispute governed by Sharia rules and standards in relation to the purchase of crude oil for a Moroccan entity. The firm promoted Moustafa Alameldin to counsel. It also hired a number of senior associates to assist with the influx of counsel work. “They also think strategically with you as a client rather than laying their strategy upon you, which opens new angles in the case,” he adds. “Deliverables are met and exceeded, professionalism, perseverance, efficiency, tactfulness, and sharpness are part of the package deal”, he adds. Youssef & Partners is like no other practice in Egypt. We are a full-service firm with a cosmopolitan and international outlook, exercising regional influence and delivering client services to truly global standards. The firm's renowned flagship practice is commercial and investment treaty arbitration with a focus on complex and high-value disputes. Our unparalleled multinational expertise, strong business sense, superior strategy, and remarkable track record maximize clients' results. Headed by Dr. Karim A. Youssef, a leading figure in Middle Eastern arbitration, the arbitration and international law team at Youssef & Partners is one of Egypt and the MENA region’s most elite and sophisticated. As Egypt’s premier arbitration practice, the firm focuses on representing local and foreign investors in some of the largest and most significant investment treaty and commercial cases in the MENA region. Located in Cairo, Youssef & Partners handles major local and international disputes and advises some of the world’s leading corporations across the MENA region. The firm’s global outreach is second to none in the region; we are involved in arbitral or court proceedings in four continents. Geographical boundaries are less relevant by the day, and our core belief is that clients should not have to suffer less than state-of-the-art lawyering and counsel services simply because they do business in emerging or foreign markets. 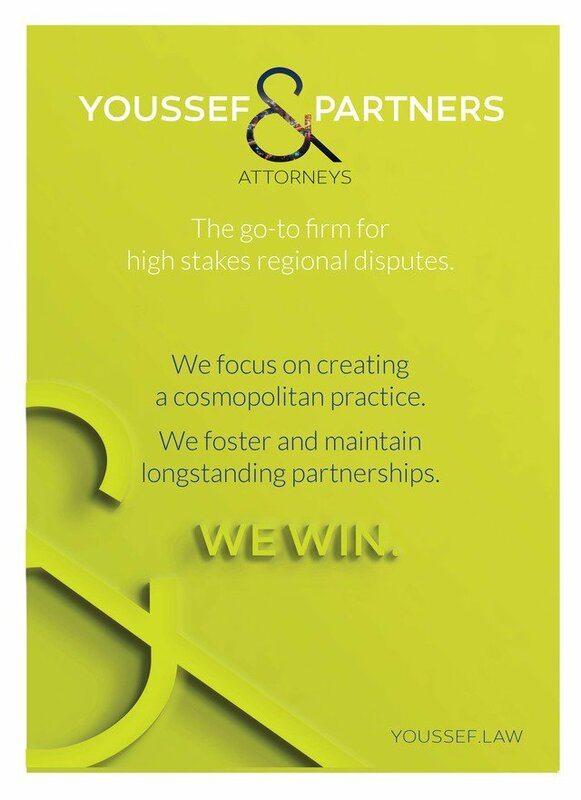 Youssef & Partners works to win, and our unqualified reputation in the local and international markets is that we do. We focus on what matters most to our clients and we make it happen.